When Nokia N8 in 640x360 resolution (perfect 16:9 aspect ratio) was announced with Symbian^3 as the "best entertainment phone" or "portable entertainment center", the battle between Symbian^3 and Android 2.2 started. The Nokia N8 supports many video formats including DivX and XviD, alongside the Android standards of H.263, H.264 and WMV. However, you may also need to convert TiVo recorded videos, MKV videos downloaded from torrent site or Flash videos to Nokia N8 format. Aunsoft Video Converter is the recommended Nokia N8 video converter to help you convert TiVo to Nokia N8, MKV to Nokia N8, AVI to Nokia N8, VRO to Nokia N8, FLV to Nokia N8 and even VOB to Nokia N8 movie format. Below is the simple step-by-step guide with the easy way to transfer and sync videos to Nokia N8 using Aunsoft Video Converter and Nokia Ovi Suite on Windows 7. Step 1. Load HD videos to Aunsoft Video Converter. Free download Aunsoft Video Converter as the best Nokia N8 video converter, and click the "Add" button to browse the video and movie files like .tivo, .mkv, .vro, .avi, .vob from computer hard drive. Alternatively, you can drag and drop the videos from Explorer to the converter UI for conversion. Step 2. Choose Nokia MP4 format. Click the "Format" option and choose Nokia > Nokia MP4 series(*.mp4) as output format. The default profile is to convert movies to MPEG-4 .mp4. To get high quality video on Nokia N8 Symbian phone, just go to the next step. Step 3. Get Nokia N8 640x360 videos. 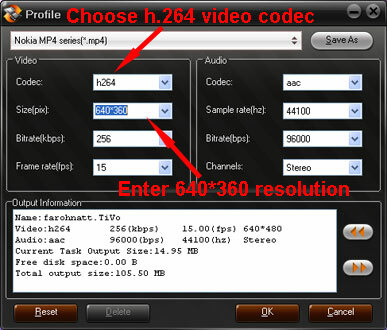 To make use of the 640x360 resolution, just click the "Settings" button and choose h264 as video codec and enter "640*360" as video size in pixels. Step 4. Convert videos to Nokia N8 MP4. Click the convert button under the preview window, and the conversion from HD videos to MP4 for Nokia N8 will start immediately. Way 1. Connect Nokia N8 to computer with USB cable or Bluetooth. With Nokia Ovi Suite installed on your PC, you can right click on the video and select Copy to phone, and the video will be copied to Nokia N8. Way 2. After connecting Nokia phone to computer, you may also go through the Nokia Ovi Suite UI. Even though there is no video icon, you can add videos to Nokia Ovi Suite Photo library and then click the Sync button. 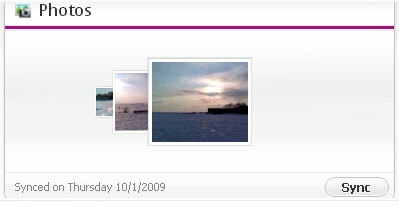 Below is the screenshot of the Photos icon on Nokia Ovi Suite. More details please check:Sync or copy/transfer movies and music to Nokia N8. After downloading videos from computer to Nokia N8, you can enjoy the movies on the Symbian smartphone anytime and anywhere. How to put and play Movie/Music on HTC 7 Surround?